New data from the ancient ice of a Bolivian glacier show that this region's worst exposure to airborne lead in the last 2000 years came not from metal smelting by the Incas or the Spaniards, but from leaded gasoline just 50 years ago. Our ill-fated experiment putting lead in gasoline appears to have tainted Earth with the toxic metal far more than any other source. Thus the 20th-century political battle over leaded gas, which put America generations behind in lowering greenhouse gases, left its mark across the whole world. Climate scientists are interested in glaciers because every year they trap samples of water, dust and gases in layers of snow and ice. Some glaciers preserve these samples for many thousands of years. The great ice caps of Antarctica and Greenland have the longest records. They yield information on volcanic eruptions near and far, ancient air temperatures and the human output over recent centuries of industrial wastes. Ice records from outside the polar regions are precious and endangered, especially in the tropics. One of these records is preserved in glaciers on the 21,000-foot peak of Nevado Illimani, in Bolivia. An open-access paper just published in the journal Science Advances reports on 2000 years of atmospheric lead, in an ice core that was collected in 1999. The data shed light on the history of technology before and after Columbus opened the New World to Europe around 1500. Bolivia has always been an exceptional producer of metals—at first, silver, and later other metals like copper and nickel. Most metal ores contain lead as an impurity, so smelting releases lead-bearing dust into the air. Tiny lead-bearing particles are preserved not only in Illimani's ice, but also in lake-bottom sediments around the region. 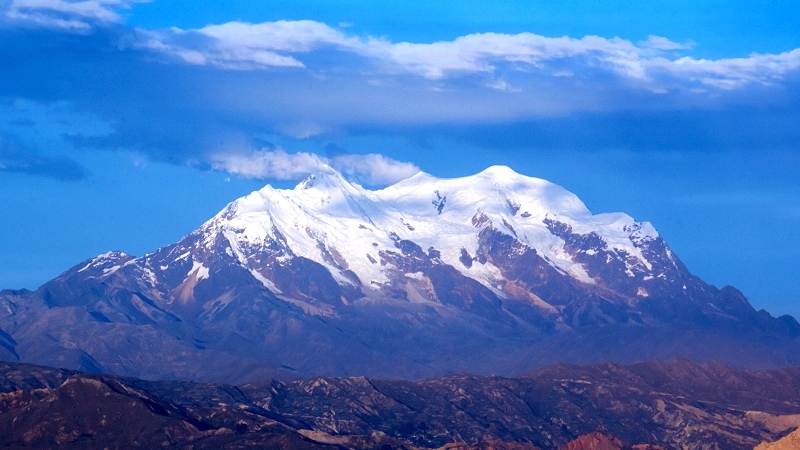 The top 127.5 meters of Illimani ice is a record of 20 centuries of metallurgical history. First came the wealthy Tiwanaku and Wari cultures, which smelted silver between the years 450 and 950. Lead levels rose to double the natural average at this time. 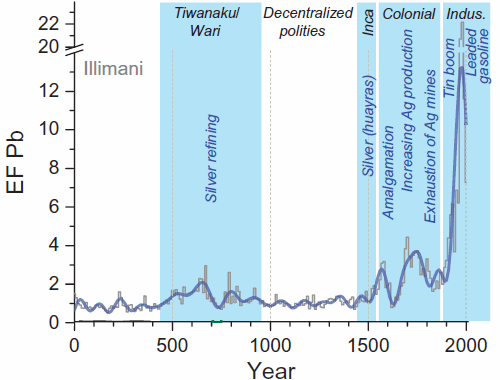 A three-century-long drought replaced these empires with "decentralized polities," and lead levels fell until the Incas took up silver mining again, starting around 1450. When the Spanish conquistadors toppled the Incas in 1532, Bolivia became the Saudi Arabia of silver, with lead emissions rising to four times background. The long silver boom ended with the 1700s. Then came the tin boom of the 1900s, when Bolivia was consistently among the top three producers of that important metal. Tin ores, like silver ores, contain lead as a contaminant, and the ice bore witness to lead pollution as much as six times background, well above any previous extreme since the year zero. As tin faded, copper and nickel mining kept lead levels well above background in the Illimani ice record. But lead pollution rose three times over even these unprecedented levels when lead was deliberately added to gasoline, peaking in the 1960s and finally ending in the early 2000s. Excess lead is recorded in the Greenland and Antarctic ice caps too. You could argue that mining of tin, copper and nickel helps civilization far more than the harm it may cause from lead emissions. But how did we come to think it was a good idea to spray poisonous lead out of every tailpipe in the world? A meticulous history of leaded fuel by Professor Bill Kovarik, of Unity College, shows that in a pitched battle between American oil drillers and grain farmers in the 1920s, tetra-ethyl lead ("ethyl") was a key weapon. Gasoline engines were prone to "knock" and the fuel supply came increasingly from foreign oil wells. Ethanol had domestic sources and was immune to knock. But ethyl enabled gasoline engines to avoid knock, if you didn't mind putting toxic lead in the exhaust. Kovaric shows that major actors like General Motors and the American Petroleum Institute won the day in the lobbies of Congress and federal agencies. Under attack from lobbyists and Congress, agencies suppressed scientific research on ethyl's toxicity and ethanol's performance. The contest between gasoline and ethanol was not a fair one. "In essence," Kovarik concluded, "political conditions shaped the marketplace and the new competition [ethanol] faced a difficult economic playing field heavily tilted toward established industries." Ethanol lost out to oil in the 1930s. Today it's mounting a comeback aided by a new political factor, greenhouse gas emissions. A recent study in the journal Environmental Science and Technology compared three ethanol-producing crops—cornstalks, switchgrass and a hybrid form of miscanthus grass—and found that miscanthus, a relative of sugarcane, offers as much as three times the climate benefit of corn. This kind of analysis can influence climate policy—but only if it can win a place at the policymaking table. The battle for the transportation fuel market goes on. Ethanol remains handicapped by eight decades of opposition, but at least toxic lead is out of the picture.